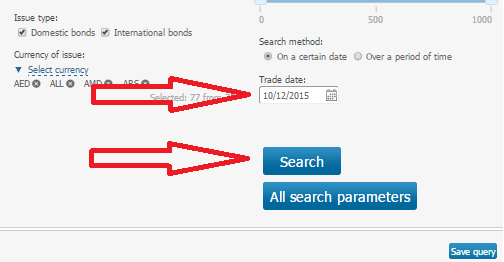 A list of bonds with up-to-date quotes and yields can be obtained by using the functionality of the section of quotes search . The latest current date is set by default in the field “Trading date”. Select the required search parameters and click “Search. To choose a list of fields to be displayed in the search results, click “Search parameters” above the table and select the required parameters in the opened list, e.g. : trading date, stock exchange name, BID, ASK, etc. More information on quotes search functionality is available in Training video on the section “Bond quotes by trading systems”.